United Nations (United States) (AFP) - UN Secretary-General Antonio Guterres voiced alarm on Wednesday over allegations of chemical attacks in Syria and urged the Security Council to take action to address "such serious crimes." The appeal came after Guterres met on Tuesday with the head of the Organisation for the Prohibition of Chemical Weapons (OPCW), which has investigated more than 70 cases of toxic gas attacks in Syria since 2014. "The secretary-general is alarmed at the persistent allegations of the use of chemical weapons in the Syrian Arab Republic," said a UN statement. While the use of chemical weapons is "unjustifiable and abhorrent," "equally unjustifiable is a lack of response to such use," said the statement. "Impunity cannot prevail with respect to such serious crimes." 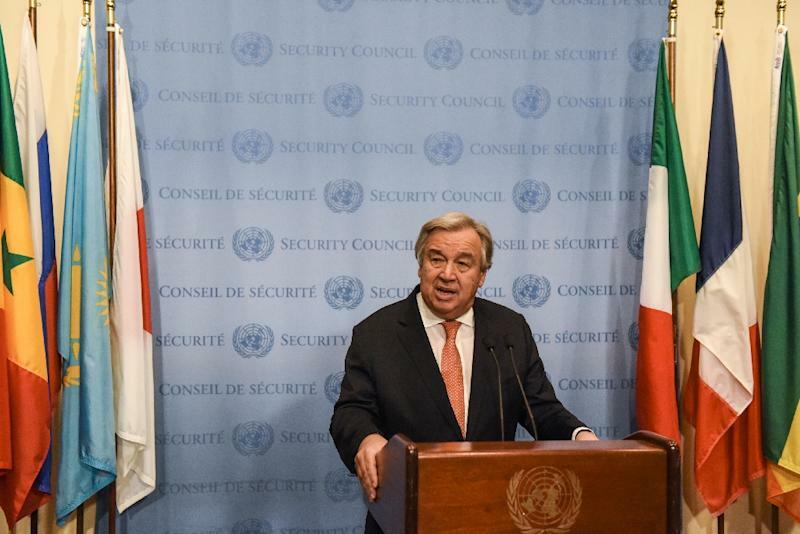 Guterres renewed a call to the council "to demonstrate unity and resolve on this matter". OPCW chief Ahmet Uzumcu said there had been "several" recent allegations of chemical weapons use in Eastern Ghouta, where the Syrian government is battling to take control over the enclave near Damascus. The Syrian Observatory of Human Rights has said that chlorine has been used as a toxic agent on villages during the government's offensive in Eastern Ghouta. Uzumcu said the experts were looking into allegations of chlorine use that were attributed to the Syrian army and to rebel groups. The OPCW's fact-finding mission for Syria was established in April 2014 to determine whether toxic agents were used as a weapon, but it does not have the mandate to establish who is responsible for its use. The Security Council in 2015 set up a panel to determine who was behind the attacks, but that inquiry ended last year when Russia vetoed the extension of its mandate. Russia maintained that the panel, known as the Joint Investigative Mechanism (JIM), was biased and unprofessional after it concluded in a report that Syrian forces had used sarin in an attack on the rebel-held town of Khan Sheikhun in April last year. Russia has presented a draft resolution to the council that would set up a new panel -- but the United States, Britain and France have rejected the proposal, which they see as a bid to weaken the inquiry. The United States has circulated a rival draft resolution, but Russia has dismissed that proposal as a bid to revive the defunct JIM. UN diplomats are pessimistic about prospects for a compromise after several rounds of negotiations failed to achieve progress.